Prayaas 2008, a Social Entrepreneurship Competition was organized by SIES College of Management Studies (SIESCOMS) in Collaboration with Centre for Social Initiative and Management (CSIM) on Saturday the 29th March 2008 at SIES College, Nerul, Navi Mumbai. Social entrepre neurship is a growing field that combines social work principles with a business like approach to advance societies and address social problems in an innovative and effective manner, expressed Dr. A.K. Sengupta, Director of SIESCOMS in his inaugural address. The objective of the competition provides an opportunity for academicians, research scholars and students to build business/ social enterprise plans that have positive impact on the societym he added. Prayaas 2008 had invited entries from NGOs/ groups on social entrepreneurial theme touching poverty, health, education and environment. Six entries emerged to the final round was presented before the judges for selecting top one and two. WINGS proposed to take up marketing of NGO products in India while NAVKIRAN took the initiative of finding an alternative avenue for farmers. FLAMES spoke about reducing the mental stress of studies on students while another project was prepared to curb female feoticide in India with management techniques. Another upcoming entrepreneur planned out an innovative medical scheme for the middle class and lower middle class families while another volunteer through his expert opinion tried to give dignity to the beggars. The judges for the event comprised Dr. A. R. K. Pillai, President, Indian Development Foundation (IDF), Dr. Narayan B. Iyer, National Co-ordinator, Indian Development Foundation (IDF), Ms. Kavita Kowshik, Managing Director, Maitreya CSR Pvt. Ltd., Mr. Ganesh Srinivasan, Consultant, Mckinsey & Company. The presentations were excellent and we tried to judge the project on the ground of innovation, feasability, sustainability and result-oriented approach, said Dr. Pillai. It is the need of the hour that management expertise is used in social areas for building a better society, he added. We are happy to see young management students taking up social issues and finding a solution and wayout through managerial skills, expressed the judges. After evaluation and thorough examination, the innovative presentation of medical policy scheme for the families emerged out to be number one. Mr. Denny John who conceived and presented the project of mediclaim policy received a prize money of Rs.10,000/= and a trophy. The runner-up team NAVKIRAN led by the management students Pooja, Dipti and Amrita received a prize money of Rs.5,000/=. I am indeed happy to r eceive the first prize and i am confident this will definately give me a good boost to serve the society. I do know there are competition of medical policies in the market, but a lot need to be done in creating awareness on health, said Mr. Denny John. The trio from Navkiran expressing their happiness of winning the second prize said their approach to give alternative avenues to the farmers and finding market for the agro-products will definately help in curbing farmer suicides. Prayaas 2008 event was organised by Mrs. Gayatri Vivek, Program Co-ordinator, PGDSEM, SIES College of Management. I am happy that several management students took keen interest in social entrepreneurial programme, Mrs. Gayatri said. 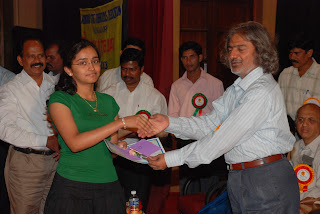 World TB Day 2008 was jointly organized by Karnataka State Health and Family Welfare Department (TB Division), Karnataka State TB Control Society and Indian Development Foundation at Bangalore on 24th March. Mr. Madan Gopal, Secretary, Karnataka State Health and Family Welfare Department inaugurated the event and observed that every individual has a social responsibility towards stopping TB. He called for complete involvement of all the health personnel and community volunteers to make the RNTCP (Revised National Tuberculosis Program) a great success. Mr. Gopal honoured nine students from various colleges and schools in the city with certificates and cash prizes for their meritorious participation in `Let’s Stop TB’ Essay writing competition organized by the Indian Development Foundation. Mr. Basavaraju, Commissioner, Karnataka State Health and Family Welfare Department expressed happiness on the participation of Medical Officers Tuberculosis Centre, Senior Treatment Supervisors and Senior Treatment Lab Supervisors in the World TB Day. He felicitated the DOTS providers and representatives of the NGOs for their excellent work. Sri Japananda Swamiji, Director, Vivekananda Rural Development Society, Pavagada, and the Chief Guest, released the health education materials on TB. He pointed out the need for better collaborative efforts between the Government and NGOs and stressed the importance of promoting community participation in TB work. Dr. Dinamani, Joint Director, Karnataka State Health and Family Welfare Society (TB Division) presented a report on RNTCP activities in the State. Dr. Prem Leela, Director, Karnataka State Health and Family Welfare Department, Dr. Surya Narayan from National Tuberculosis Institute, Dr. Subramaniam, President, Family Physicians Association graced the occasion. Dr. S. Franklin, Area Manager, Indian Development Foundation (Karnataka) expressed his thanks for making IDF a partner for the World TB Day event as he received honours for providing better support and co-ordination. Mr. Chidambaram, Manager-SR, IDF and the IDF Karnataka team comprising Mr. H. Gurumurthy, Mr. K. Srikantha and Mr. Umesh Prasanna lent support in organizing the event. Earlier Dr. Shashidar Buggi, Secretary, Karnataka State TB Control Society, welcomed and gave a brief account of TB status in Karnataka. Stage shows were performed by nursing students of St. Martha’s Hospital and volunteers from Sandeep Seva Nilayam, and Gejje Hejje Association, enlightening the participants on the importance of regular and complete treatment. When Rambhau Patil, 35, from Wada was diagnosed with bilateraltuberculosis, he decided to move to his aunt's place in Mumbai to seekbetter treatment. Little did Patil know that he would infect two moremembers of his family with tuberculosis. "We found out how infectious the disease is the hard way," says LeelaBhave, whose husband and five-year-old son contracted TB through Patil. The trio has been undergoing treatment for more than nine months now.The Bhaves are not the only ones to have met with such a cruel fate. Itis estimated that nearly six lakh Indians, unaware that they suffer fromTB, continue to infect a large number of healthy people around them. "Fear of going to a doctor, expenses, and stigma are the three biggestfactors that make tb the deadly disease that it is in India," says DrARK Pillai, who has worked with TB patients for several years and isPresident of the Indian Development Foundation (IDF). Indian Development Foundation organised Holi celebrations with the trainees of M.N.B. Industrial Home for the Blind at Jogeshwari West on Wednesday the 19th March 2008. A team from Indian Development Foundation visited the M.N.Banajee Industrial Home for the Blind, a training centre for adult blind and hostel for working blind located at Jogeshwari (West) in North Mumbai. Dr. A.R.K. Pillai, President of Indian Development Foundation said, India has over 1 million visually challenged persons as per 2001 census. Blindness is the most crippling handicap and those affected by it go through untold sufferings. It is painful to see visually challenged persons managing travel i n crowded suburban trains and negotiating their way through crowded streets. People in shelter homes such as M.N.B. Industrial Home and many others carry out excellent work to earn their livelihood. It will be in the fitness of things if the government provides community homes for them and suitable employment. NGOs can certainly collaborate and participate in such developmental programmes, he expressed. Dr. Narayan B. Iyer, National Co-ordinator of IDF wished Holi greetings to the trainees in the Home and expressed happiness in celebrating the auspicious festival with the visually challenged persons. When the world around is celebrating the festival with colours and sweets, it gives us immense pleasure in spreading the colour of love and happiness among the visually challenged people, expressed Dr. Iyer. The trainees felt very happy as they received gifts and ladoos from the visiting team on the joyful occasion. Symbolic colours were presented to mark the event of Holi. We can only feel the colour of love and happiness and this message of togetherness should be spread everywhere, expressed Ankush Patil, Shivaji and Shantanu the trainees of the Home. Mr. B. K. Gidde, Chief Executive Officer of the Home felt happy that IDF is organising such meaningful events and boosting the spirit of the visually challenged persons. While expressing gratitude to the IDF team, Mr. Gidde explained the activities of the Blind Home and exhorted people to come forward and buy products specially made by their trainees. Mr. Jayaraja Acharya, Mrs. S.N. Iyer and Mrs.Debanita Biswas from IDF co-ordinated in organising the colourful event. Dr. Sharad Nayampally, IDF Ambassador remembered the famous quote of Helen Keller that the best and most beautiful things in the world cannot be seen or even touched, but they must be felt within the heart. NEW DELHI: Over six lakh Indians, unaware that they suffer from tuberculosis, are spreading the disease among healthy individuals, seriously jeopardizing global efforts to halve new infection and death rates before 2015. India is the world's TB capital recording an estimated 1.9 million new cases every year. However, only 70% of these are actually detected and put on the highly effective DOTS programme. Each of these active TB patients left undetected go on to infect 10-15 people on an average, every year. These are the findings of WHO's latest global tuberculosis control report, which warned of a global slowdown in case detection rates, specially in India and China. Between 2001 and 2005, detection rates were increasing by 6% a year globally, but in 2006, this rate was halved to 3%. The report said India and China accounted for an estimated 28% of all undetected new smear-positive cases in 2006. "Progress in case detection decelerated globally between 2005 and 2006, stalled in China and India and fell short of the global plan milestone of 65% for 2006. The African region, China and India collectively account for 69% of undetected cases," the report said. Speaking to TOI from Geneva, WHO Stop TB director Mario Raviglione said, "More new TB cases are slipping through the detection net. India saw TB case detection rates increase by 10%-12% between 2001-05. However, it fell to 5% in 2006. This could be because India's Revised National TB Control Programme, which made rapid strides during the previous five years, has almost completed all planned expansions and was therefore unable to continue at the same pace in 2006." The report said that for every five TB cases diagnosed globally in 2006, four went undetected. Speaking to TOI, Marcos Espinal, executive secretary of Stop TB, said from Geneva, "The major concern is that there is a slowdown rather than an acceleration in TB control efforts. India needs to enhance collaboration with private care providers and non-governmental, faith-based and community organisations.
" WHO estimates that a third of the world's population is infected with TB, which depletes the incomes of the world's poorest communities by $12 billion a year. However, only 61% of all TB cases worldwide are registered. In 2006, some 9.2 million new cases of TB were detected against 9.1 million in 2005. WHO expects funding to combat tuberculosis to remain flat in 2008 in almost all the countries most affected by the disease. An additional $1 billion is needed across the 90 nations which provided financial data to WHO to fight resistant strains and TB-HIV co-infection. By region, Africa had the highest TB rates while Asia had the most cases. By nation, India had the most cases, followed by China, Indonesia, South Africa and Nigeria, according to the report based on data from 202 countries and territories. IDF has created a Multi-lingual TB Poster to spread awareness on TB on the World TB Day. Indian Development Foundation will be organising `Holi Festival' in a different manner. This time the festival will be with the visually challenged persons on 19th March 2008 at 11:30 AM. Let's spread the colour of love and happiness. Do come and share the joy of participation. A quote from Helen Keller "the best and most beautiful things in the world cannot be seen or even touched, but they must be felt within the heart." 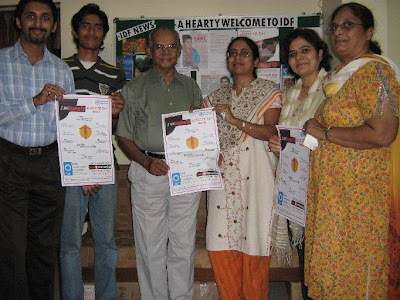 IDF Social Ambassadors - Mrs. Neeta Sanghvi, Dr. Anita Chitkara, Mrs. Debanita Biswas, Mr. Vivek Gopal and Mr. Nigil Rajan met the Board of Trustees of Indian Development Foundation on 15th March 2008 at IDF office. IDF Ambassadors shared their views and ideas on various social issues. Future developmental programmes and strategies on TB awareness campaigns were also discussed. Dr. A.R.K. Pillai, President of IDF appreciated the support given by the Ambassadors in the humanitarian programmes. Dr. Narayan B. Iyer congratulated the IDF Ambassadors for their good social work and wished them well. All joined hands to say `I AM STOPPING TB', as they received the World TB Day posters. IDF Ambassadors will put up TB Awareness Posters at different places as World TB Day falls on 24th March. 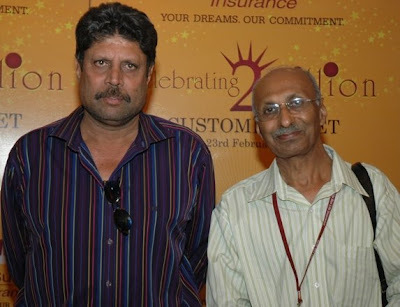 Dr. Sharad Nayampally, IDF Ambassador met the Cricket Legend Mr. Kapil Dev at Mumbai and apprised him of IDF national work. St. Gregorios School, Chembur, Mumbai received IDF Certificate of Appreciation from Dr. Narayan B. Iyer, National Co-ordinator, IDF for excellent participation in leprosy and tuberculosis programme. Dr. Narayan visited the School on 14th March and presented the Certificate of Appreciation to a group of students and Mrs. Nilima Kulkarni, Incharge for Social Responsibility Activities. Dr. Narayan talked to the students on the growing threat of Tuberculosis to the world economy. He appealed to the students to spread awareness about the disease as World TB Day falls on 24th March. The students have expressed their desire to write on students' responsibility in social work and TB awareness programme. Mrs. Ranjini Krishnaswami, Principal of the School is a great supporter of the humanitarian programmes of IDF. Incidentally, St. Gregorios School, Chembur is the recipient of the prestigious Mother Teresa Memorial Award for excellent social work for two consecutive years, 2003-04 and 2004-05. IDF thank St. Gregorios School Team. Indian Development Foundation thank the Schoolteams for their solid support to leprosy and tuberculosis programmes. Indian Development Foundation is a partner of the StopTB Partnership. 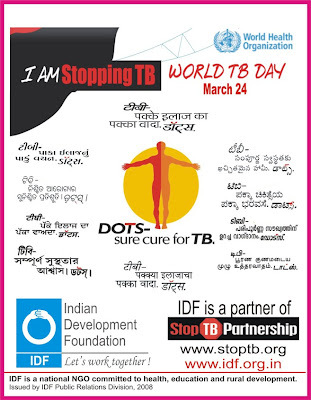 On the occasion of World TB Day 2008 which falls on 24th March, IDF has brought out a multi-lingual poster conveying the message of `Sure Cure of TB' by using DOTS. Bernice Paradesi, a second year BMS student from St. Xavier’s College who is also the IDF Social Ambassador organized a two-day Eye Camp for the children of St. Catherine’s Home at Veera Desai, Andheri West on 4th and 5th March 08. The leading opticals firm, Lawrence and Mayo joined hands with a nine member team from St. Xavier’s college to fulfill the social responsibility and provided necessary inputs. The Eye Camp was organized as a part of Corporate Social Responsibility for the Lawrence and Mayo (Opticals) and Student Social Responsibility for the St. Xavier’s College Students. A total of 179 children of the St. Catherine’s Home were examined. 39 children were referred for spectacles while 29 were referred for internal checks. 3 children were referred for minor operation. Lawrence and Mayo sponsored the spectacles while the follow ups will be made in regular intervals by the team. Sr. Udaya, Superior and Sr. Daya from St. Catherine’s Home thanked the students from St. Xaviers College and Lawrence and Mayo for coming forward and providing eye check-ups for the children of Home. Dr. Narayan B. Iyer, National Co-ordinator of Indian Development Foundation congratulated IDF Social Ambassador Ms. Bernice Paradesi and the entire team from St. Xavier’s college for initiating such a wonderful social responsibility programme for the underprivileged children. Students from different colleges need to come forward and take part in the student social responsibility programmes, said Dr. Narayan. “I am really happy that my college-mates have spent time in the two-day eye camp and learnt a lot of social service activities”, asserted Bernice Paradesi. The team from St. Xavier’s and Lawrence & Mayo felt proud of taking part in such a wonderful social event. Dr. Srinidhi Ravi was honoured at the International Women's Day for the wonderful participation in leprosy work during her internship with Bombay Leprosy Project at the BLP's Office at Marathi Vidnyan Parishad, Sion-Chunabhatti, Mumbai on 8th March 08..
Srinidhi took keen interest in studying basic aspects of leprosy including diagnosis and management of routine patients and those with clinical problems. Srinidhi also volunteered in collecting information and data entry of various research projects in leprosy during her internship. When asked for a mes sage on the International Women's Day, Srinidhi said that women are entitled the rightful place in society and better health for women will eventually lead to evolving a healthy society. Dr. Srinidhi has volunteered to a Social Ambassador of Indian Development Foundation and further developmental programmes, particularly women and children. Dr. A.R.K. Pillai, President and Dr. Narayan B. Iyer, National Co-ordinator of Indian Development Foundation welcomed Dr. Srinidhi's initiative to serve the society. Dr. R. Ganapati, Emeritus-Director, Dr. V.V. Pai, Director and Dr. Sharad Narvekar, Vice-President of Bombay Leprosy Project congratulated Dr. Srinidhi Ravi for her outstanding work. 8th March is observed as International Women's Day. It is a major day of global celebration for the economic, political and social achievements of women. Women of today are being empowered, establishing their identity and creating a revolution in the Society. Women today have excelled in every field of activity and many have carved a niche for themselves for which they deserve to be lauded. Kudos to the women of today ! Though there are great progresses made by women, they still remain the most exploited and weaker section of the society. Gender imbalance, education, social security, employment and a lot need to be attended to improve HER overall development. The slogan India Poised will be complete only when the Women in the society are Empowered. IDF join hands with the nation towards Women's Empowerment programme. IDF wishes Women of today a Happy Day. Corporate Social Responsibility is heard everywhere these days. We had sent an email to our friends about the IDF Greeting Cards. These cards are specially designed by the underprivileged children of our Centre. The proceeds on the sale of IDF GREETING CARDS goes for the uplift of the poor and the needy in the society. Please see CLICK HERE for getting more details on Cards. We had suggested to corporates/ companies/ banks/ insurance agencies to GREET their clients/ contacts with IDF Greeting Cards. We are happy to inform you that SETCO AUTOMOTIVE LIMITED have come forward and purchased IDF GREETING CARDS to GREET their clients/ customers/ employees with IDF CARDS on their BIRTHDAY. We take this opportunity to thank SETCO AUTOMOTIVE LTD in initiating this Social Step and setting an example for others to emulate. We are CONFIDENT that more CORPORATES will join hands with IDF in wishing their near and dear ones with IDF BIRTHDAY CARDS. Why postpone goodness in life ? What is possible today, may not be possible later ! 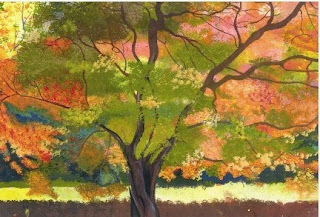 Don't forget to see the link given above for the details of IDF GREETING CARDS.